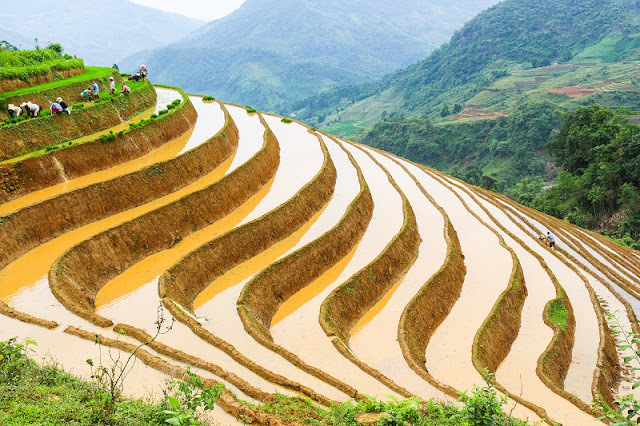 When is the rice harvest in Sapa? 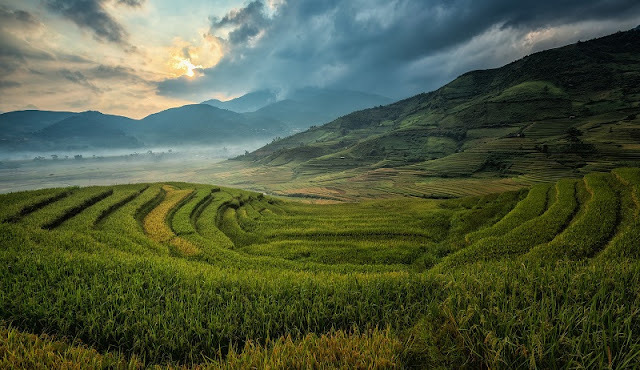 Is an expression of Northern Vietnam, terraced fields bearing a majestic beauty, spectacular curves around the mountainside have attracted thousands of tourists around the world to visit. Not only majestic, those terraced fields also have soft, charming moments like gentle Hmong girls in rice harvest season. 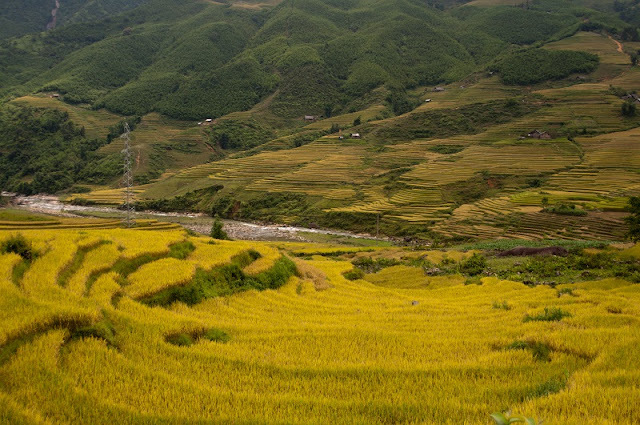 The scenery of the Sa Pa region in large part reflects the relationship between the minority people and nature, which can be seen perceptibly in the paddy fields carpeting the rolling lower slopes of the Hoang Lien Mountains, especially in harvesting season. It was the elements wearing away the underlying rock over thousands of years that created this impressive physical landscape. As usual, in April and May when the local people water their fields at full to prepare for a new crop, the surface of terraced fields shines like a mirror reflecting the contrast of the reddish brown of soil, the deep blue of the sky high above and the green of surrounding forests. Embankments surrounding these terraces look like threads softly lined by the painter. In June and July, the terraced rice fields with fully-grown paddy rice and forest trees spread the green out to the entire area, from the foot to top of mountains, before disappearing in mist. The green of paddy rice grown on the terraced field makes tourists think of it as a hand-made creation of uniqueness which cannot be found anywhere else. About 1 – 2 weeks in the between of September and October, Sapa is in harvesting season. At that time, rice is ripe, getting yellow in autumn sunshine and begin to drop. Nature is not only given to the people of this land landscape and ideal climate, but also gives them the skillful hands. Reaping or cutting is the first operation in harvesting. The rice crop is cut by using simple hand tools like sickle or hand-held knives. A mountainous sickle is shorter than the one of plain and less curved. It is a bit longer and more curved than a small knife. During the time, the terraced rice fields look like golden silk scarves flying over in the wind above green mountain slopes, or like the golden ladder to the sky, making the mountainous landscape astonishingly beautiful. It is one of the best experience in Vietnam highlights tour. It is credible if the tourists feel lost in another world.